A new book on homeopathy challenges conventional medicine, which touts itself as scientific even though it is largely run by businessmen, not doctors. The following is an excerpt from The Homeopathic Revolution: Why Famous People and Cultural Heroes Choose Homeopathy, by Dana Ullman. And yet, strangely enough, whatever has been in vogue in conventional medicine in one decade has been declared ineffective, dangerous, and sometimes barbaric in the ensuing decades. Surprisingly, despite this pattern in history, proponents and defenders of "scientific medicine" tend to have little or no humility, continually asserting that today's cure is truly effective. Medical history uncovers an obvious pattern in the discovery and application of drug treatments. Initially, there is great excitement about a new drug's discovery. Research has seemingly proven its safety and efficacy and leads to widespread appreciation for the drug's ability to provide relief. Over time, there are minor concerns about the drug's side effects, until more research and clinical practice uncover more serious concerns about its side effects. Then, more research and clinical experience lead to more serious questions about the drug's real safety and efficacy, until there is general acknowledgment that the drug doesn't work as well as previously assumed, and there is recognition of an increasingly long list of serious side effects over time. However, these problems are not really problems because a new drug emerges, with short-term research that suggests it is a better drug after all. That is, until new research con- firms that it is neither as effective nor as safe as previously thought. And the cycle has continued like this for a century or more. Like the fashion industry with its regular changes in style, the drug industry makes its profits on the newest drugs rather than on the older ones -- and not just any profits, but sickeningly high profits. In 2002, the combined profits ($35.9 billion) of the ten largest drug companies in the Fortune 500 were more than the combined profits ($33.7 billion) of the remaining 490 companies together (Angell, 2004, 11).1 The only reason these drug companies did not maintain this shocking financial advantage is that the oil companies' profits have increased considerably with the Iraq War, thus raising the 490 non-drug companies' profits slightly higher. But then again, one would assume that the profits of 490 of the largest companies in the world would be substantially more than just ten companies in one commercial field. This economic information is important, even essential, because learning how to separate the "science" of medicine from the business of medicine has never been more difficult. The combined efforts of the drug companies and the medical profession, which together may be called the "medicalindustrial complex," have been wonderfully effective in convincing consumers worldwide that modern medicine is the most scientific discipline that has ever existed. Before discussing homeopathy, it is important, if not necessary, to raise basic questions about what "scientific"medicine is -- and is not. Yes, a gorilla is in the house, but anyone who refers to him as a gorilla is usually called a quack or a crank. This gorilla was not born yesterday; he has been growing for generations. A part of his self-defense propensities is to eliminate competing forces, whether the other side seeks cooperation or not. Any competitive force is frequently and soundly attacked. The history of homeopathy shows this side of medicine, for from 1860 to the early twentieth century, the AMA had a consultation clause in its code of ethics that members were not allowed to consult with a medical doctor who practiced homeopathy and weren't even allowed to treat a homeopath's patients. At a time in medical history when doctors bloodlet their patients to death and regularly prescribed mercury and various caustic agents to sick people, the only action that the AMA considered reprehensible and actionable was the "crime" of consulting with a homeopath. In fact, the entire Medical Society of New York was kicked out of the AMA in 1881 simply because this state's medical organization admitted into its membership any medical doctors who utilized homeopathic medicines, no matter what their academic credentials were. They only rejoined the AMA twenty-five years later (Walsh, 1907, 207). This King Kong, however, is not a monster to everyone. In fact, this big gorilla is wonderfully generous to executives, to large sales and marketing forces, to supportive politicians , and to the media from whom he buys substantial amounts of advertising (and thus, an incredible amount of positive media coverage). And this gorilla is wonderfully generous to stockholders.While it may seem inappropriate to criticize profits, it is important and appropriate to do so when profits are unbelievably excessive, when long-term efficacy hasn't stood the test of time, and when common use of more than one drug at a time is rarely if ever scientifically tested for efficacy. We should not "throw the baby out with the bathwater," nor do we want to ignore the bathwater in which we place our babies. Most of us also know someone whose health has been seriously hurt, or whose life was cut short, by modern medical treatments. Drug companies defend their large profits by asserting that they spend tremendous amounts of money on research and development, but they tend to hide the fact that they spend approximately three times more money on marketing and administration. And the obscenely high profits of the drug companies take into account all known expenses. Ultimately, drug companies are wonderfully creative in convincing us all that their drug treatments are "scientific," and too many of us actually believe them. It is therefore important to understand what is truly meant when drug companies and the media assert that drugs are "scientifically proven." Mahatma Gandhi was once asked by a reporter what he thought about Western civilization, and in light of the uncivilized treatment by the British government of his nonviolent actions, he immediately replied, "Western civilization? Yes, it is a good idea." Likewise, if he were asked what he thought about "scientific medicine," he would probably have replied in a similar manner. The idea of scientific medicine is a great one, but is modern medicine truly, or even adequately, "scientific"? Modern medicine uses the double-blind and placebo-controlled trial as the gold standard by which effectiveness of a treatment is determined. On the surface, this scientific method is very reasonable. However, serious problems in these studies are widely acknowledged by academics but remain unknown to the general public. Fundamental questions about the meaning of the word "efficacy" are rarely, if ever, raised. For instance, just because a drug treatment seems to eliminate a speci- fic symptom doesn't necessarily mean that it is "effective." In fact, getting rid of a specific symptom can be the bad news. Aspirin may lower your fever, but physiologists recognize that fever is an important defense of the body in its efforts to fight infection. Painkilling drugs may eliminate the acute pain in the short term, but because these drugs do not influence the underlying cause of the discomfort, they do not really heal the person, and worse, they can lead to physical and psychological dependency, addiction, tolerance, and increased heart disease. Sleep-inducing drugs may lead you to fall asleep, but they do not lead to refreshed sleep, and these drugs ultimately tend to aggravate the cycle of insomnia and fatigue. Uncertainty remains for the long-term safety and efficacy of many modern drugs for common ailments, despite the high hopes and sincere expectations from the medical community and the rest of us for greater certainty. The bottom line to scientific research is that a scientist can set up a study that shows the guise of efficacy. In other words, a drug may be effective for a very limited period of time and afterwards cause various serious symptoms. For example, a very popular anti-anxiety drug called Xanax was shown to reduce panic attacks during a two-month experiment, but once the person tries to reduce or stop the medication, panic attacks can increase 300-400 percent ( Consumer Reports , 1993).Would as many patients take this drug if they knew this fact, and based on what standard can anyone honestly say that this drug is "effective"? To get FDA approval to market a drug, most of the studies for psychiatric conditions last only six weeks (Angell, 2004, 112). In view of the fact that most people take anti-depressant or anti-anxiety medicines for many years, how can anyone consider these short-term studies scientifically valid? What is so little known and so sobering is that research to date has found that placebos were 80 percent as effective as the drugs-with fewer side effects (Angell, 2004, 113). Marcia Angell,MD, author of the powerful book The Truth about Drug Companies , said it plainly and directly: "Trials can be rigged in a dozen ways, and it happens all the time" (Angell, 2004, 95). Conventional drugs used today are so new that there is very little longterm research on them. There are good reasons why the vast majority of modern drugs that were used just a couple of decades ago are not prescribed any more: They don't work as well as previously assumed, and/or they cause more harm than good. The extremely high numbers listed above are considerably higher if one adds in the over-the-counter drugs that doctors recommend or that patients take on their own.When a patient takes more than one drug at a time, the research conducted on each of the drugs individually becomes virtually meaningless. Considering how many people take two or more drugs together raises serious doubts about the scientific ground on which physicians stand (except in those few instances when a multiple-drug protocol has been tested, as has occurred with some drugs in the treatment of people with AIDS). * According to 2006 data, the infant mortality rate in the United States was ranked twenty-first in the world, worse than South Korea and Greece and only slightly better than Poland. One of the largest drug companies in the world is GlaxoSmithKline. It was therefore a bit shocking, but not surprising, when Allen Roses, worldwide vice-president of genetics, acknowledged that "The vast majority of drugs -- more than 90 percent -- only work in 30 percent or 50 percent of the people" (Connor, 2003). The public is not frequently given this degree of honesty. History provides us with a tremendously diverse body of evidence about our past, but ultimately, only a small portion of history is told in our history books. The interpretation of our past and the select use of certain historical facts and figures taint our understanding of what really happened. Historians commonly remark that whichever country wins a war or whichever worldview dominates another, the history is told through that country's perspective or that dominant point of view. This is certainly true in the history of medicine. For instance, medical historians commonly have portrayed conventional medical practice of the past as barbaric, dangerous, and old-fashioned, and yet they have asserted that today's medical care is at the apex of "scientific medicine." The assertion that today's medical care is "proven" is a consistently repeated mantra. Besides name-calling, practitioners of the conventional and dominating paradigm often spin facts to make the strong and solid features of a minority practice into something strange and weird. The fact that homeopaths use smaller doses than used in orthodox medicine has been portrayed as homeopathy using "wimpy" doses that theoretically could not have any physiological effect. Accusations that homeopathic medicines could not possibly have any effect are made without knowledge, experience, or humility, and such accusations simply become evidence of the accuser's unscientific attitude and his or her ignorance of the diverse body of basic scientific work on the effects of nanodoses of certain substances in specific situations. The fact that homeopaths have used their medicines for more than 200 years is spun as evidence that this system of medicine has not "progressed." Another interpretation here is that the same homeopathic medicines used 200 years ago are still used today, along with hundreds of new ones, primarily because the old ones still work. The art of using homeopathic medicines is that they are not prescribed for a localized disease but for a syndrome or pattern of symptoms of which the localized disease is a part. The fact that homeopaths interview a patient to discover his or her unique symptoms has been spun to make homeopathy seem like a quirky system that revels in inane facts about a patient. However, the detailed symptoms and characteristics of the patient that homeopaths collect may seem inane only to people who are not familiar with the unique and critical nature of these individualizing features of each person. Homeopathy provides a sophisticated method by which a patient's characteristics are applied to selecting and prescribing the most effective homeopathic medicine. In light of the fact that history tends to be written by the victors, this writer predicts that history will soon be rewritten. 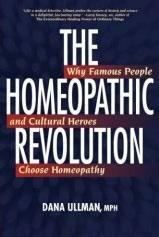 For more information on homeopathy, visit www.homeopathic.com. Fair Use Notice: There is no attempt here to usurp any copyright but only to distribute useful and educational information to a non profit audience.